What this means in practical terms is that while your primary type remains home base, you will be influenced by your wing. As a Nine, your primary motivations will revolve around keeping the peace, focusing on the positive, and going along to get along. However, you will be influenced by your Eight wing, particularly in the way you express anger. Eights are prone to territorial anger that comes on strong and fast and can be over as quickly as it began. Nines with Eight wings are slow to anger, but once they are, it’s quick and decisive. In contrast, Nines with One wings express anger as a slow burn with a very definite focus on an internalized system of morality. In the Riso-Hudson teaching, each of the nine types will be influenced by one or the other wing, leading to 18 subtypes. 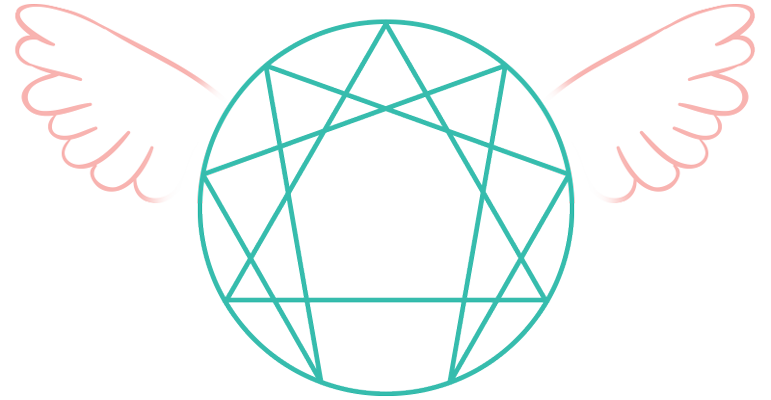 Looking at the Enneagram symbol, you will notice an arc between each point representing the types. 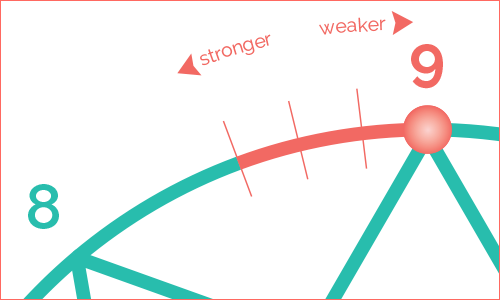 This arc can be used as an expression of one’s wing such that the closer to the midpoint of the arc between two types, the stronger the wing will be. The closer to the primary type, the weaker the wing. Theoretically speaking, one could potentially land exactly on the primary type which would lead to “balanced wings,” meaning you’re equally influenced by both wings. However, this would necessarily be statistically rare. According to some Enneagram teachings such as the Enneagram in the Narrative Tradition, we all have access to both wings and can call on one or the other as the situation demands. My personal take on this is this is true up to a point, and it’s dependent on our Level of Development. One thing we always need to keep in mind is that we all have access to each of the types. It’s just that when we’re fixated and behaving on autopilot (at a lower Level of Development), we tend to favor our primary type as influenced by our wing. As we become healthier, we begin to have greater access to the abandoned or neglected aspects of ourselves which we could say are expressions of the other types. This greater access usually begins with the types that we have the strongest connections with, such as our “other wing,” our points of integration and disintegration, etc. I believe that it’s due to this dynamic that some people have experienced a balanced wing state in which they are able to access whichever wing will best support them in the moment. However, I would reiterate that this would require a higher than average Level of Health simply because by definition, our type and wing are expressions Ego’s manifestation in us when we are more fixated As we begin to loosen our own bonds, these fixations fall away, and rather than gaining a new “wing,” we simply gain greater access to all aspects of our being.